Now with 286 Registered Train Fans! - This list is no longer being updated. 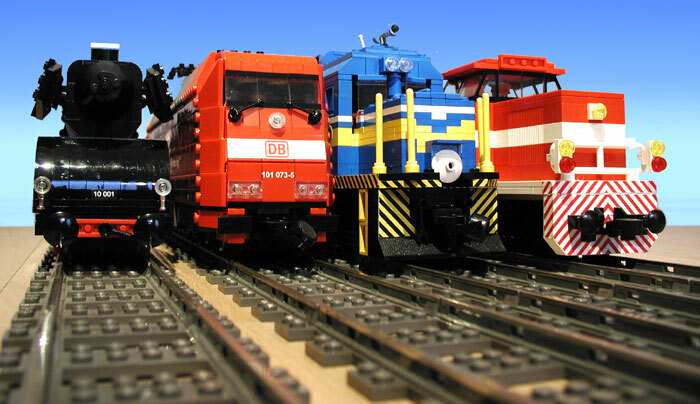 Introduce and share your passion for Lego Trains here. Pictures of your Lego Trains and Train Towns are encouraged. Okay, I'll go ahead and start by saying, Welcome to Train Tech! I'm TheBrickster, one of the EB moderators, and long time collector of Lego -since the mid to late 1970s. Yes, my early childhood during the late 70s was spent with Lego basic building sets, followed by Town, Castle, and Space. Unfortunately, growing up in the United States, trains were not available in the shops during the era (at least I don't remember seeing them, except for maybe one push train in the early 80s). What a fabulous theme that I really missed out on. I live in the Western United States where trains play an important part of our history; from mining, cargo, to transporting people from the East Coast during the 1800s. While my personal experiences with real trains are pretty limited, I enjoy looking at pictures of old steam locomotives, Pullman coaches, as well as the refined and sophisticated look of European trains (both passenger and cargo). I love the old German steam locomotives with their large black engines and red wheels and base. Fantastic engineering marvels! I'm currently admiring all the fantastic 12V sets from Lego as well as older 9V sets like 4563 and 4564. Trying to build these out of a limited collection of train bricks is rather difficult without the original sets, but very fun and enjoyable. Lego trains are truly a great theme ring twould encourage riy Lego fan to purchase at least one set. So, again welcome to Train Tech, and I hope you enjoy the forum; and please, share your experiences and Lego train interest with our EB train community here. Well, my first train was the World City High Speed Train 4511. I only had a loop of track, so I began asking people for tracks for christmas etc. Then when I started building up a collection of track, I decided I needed another train. Bring on the Metroliner! An eBay purchase of just over 200AUD that included some extra track and and speed regulator was a nice deal set me up with two trains. I decided to find out about an LTC or LUG in my area, only to find there was none. But I did meet pe668 whilst on my quest for other like-minded LEGO train enthusiasts. I enjoyed it so much that I am planning to do it again - but a different layout. I bought 10194 Emerald Night and 50 more straigh 9v rails and still have about $1,000 AUD of purchases to make for Blocksford to be possibe in 2010, but I'll be making a big effort. I love LEGO trains almost as much as Pirates and I think the more people that are exposed to them the better. So what are you waiting for? Build a layout and take it to your local train show! It only takes many months. For a long time, I was infatuated with trains. The mechanics of their designs intrigued me even when in Preschool. When I first saw pictures for 4559 Cargo Railway I was intrigued. I asked my parents for it back in 1996 for ages, but it was too expensive back then. For Christmas 1997 I was surprised: I didn't get it but instead I got 4565 Freight and Crane Railway (Which I learned later picking it up with a transformer is more expensive than 4559 ), a set of points, and an extra set of straights. Enter 2003: I have acquired several trains and motors, another 2 sets of points, the Cargo Train and Railway Express sets, with a couple My Own Train cars. I make my trains, change them around, and the rest. Near the next year I grow tired of my trains and put them in a box with some other sets. Around 2007 pictures of the Hobby Train show up and is released in April. I pick up two sets of it and start building, getting back in my train groove. An eBay purchase of a Metroliner and I'm head of the rails again! I was amazed when the first pictures of the Emerald Night came out and I still want to get it! I might go and make one of those sprite compalations of what sets I what sets I own. I always wanted a train. In 1996, I finally got one, the 4559. I loved it because of its streamlined front. When I came out of my dark ages in 2007, I first focused at TECHNIC. However, I kept interested in trains, and a lay-out. Now I got three trains, the 4559 Cargo Railway, the 10001 Metroliner (with Club Car) and the 4565 Freight and Crane Railway. But the desire to own more realistic trains stayed. Now I want to focus at trains. I download every issue of Railbricks, and also discovered some great models. 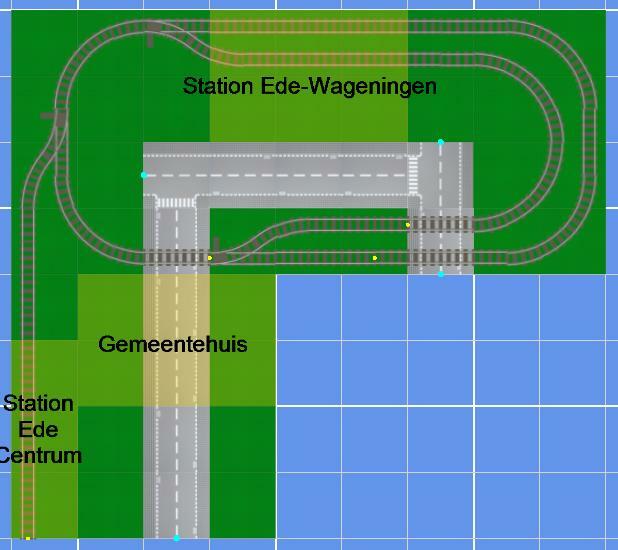 I want to build a lay-out with Dutch trains, and some buildings that are typical for Ede, the city where I live. It's hard to choose however. I'm not experienced in train building, and the most beautiful model I saw (and is usable for my lay-out) is the DD-IRM from James Mathis. I've designed two lay-outs, the second the best. The DD-IRM is too long for the second, however. I also visit some sites with pictures of real trains, railfaneurope.net and nicospilt.com. here the second. I want to use the same road plates as The Brickster has. I hope I can build it in the near future. I've always had a fascination with trains since I was a kid. I'm not sure what draws me to them, but I think it is similar to why I am drawn to airplanes...they're different. They are not something a person typically experiences every single day of their life. This is how they maintain their mystique. Growing up, I had a respectable size LEGO layout for a kid. It was roughly 4'x8'. Sadly, the only train set I had was the 4.5v set #7720 Diesel Battery Train Set. I remember fondly paging through the LEGO catalogs and seeing the 12v sets and dreaming of someday having a layout as cool as the ones I saw in those pictures. Of course, my 'Dark Ages' put a halt to that in 1995. I got married in 2002 and Stacy and I spent a couple years crashing around old logging roads in a 1986 Dodge Omni GLH. Yes, we were stage rally competitors. I was the driver and she was the navigator. We competed in both the SCCA ClubRally series and the Rally America Series. We won a couple championships, but decided to retire from racing at the end of 2005 (racing = money pit). In addition, we had started to get back into building with LEGO after rescuing my collection from my parents' house. In early 2006, we met up with GMLTC at a local train show. After talking with some of their members, I was hooked! We started buying up 9v stuff in anticipation of it potentially being discontinued. I was lucky enough to score the TTX cars, BNSF GP-38's, and full Santa Fe sets before they ever were discontinued. I also started buying motors, controllers, and track in anticipation of someday displaying our layout publicly. In 2008, we decided it was time to introduce the public to our layout. We started with the La Crosse Model Train Show as a warm-up for Brickworld 2008. The rest as they say...is history. Our collection has grown considerably as has the layout since I came out of my 'Dark Ages' in 2005-2006. We started with a 4'x8' layout and it now stands at roughly 12.5'x18'. We're only limited right now by space in our basement and our ability to transport the layout to shows. You can check out pictures of the various layouts at the links below. I will also be posting more pictures of our private 'home layout' soon. My Lego related train story begins around the mid 70's. My brother owned the old blue 12V train with the middle power rail. But at that time I was envious about my nephew who had three battery driven 4,5V trains. In connection with some crossings we had some fine crash days! I started 1979 when (classic) space was launched. 6 years later I was proud owner of the complete space sets available at that time. What a collection! I almost didn´t own anything else but space. My son had to get me out of it again, when 2003 my wife and I were looking for a christmas present. 4553 and of course some tracks. Needless to say I was pretty fast addicted again. I actually never liked the blue trains. When I found some leftovers of our childhood in the attic I sold them at ebay. 4555 , 4549 , 4532 , 2x10027 and 4554 . The rolling stock was amended with 10205 , 3x10017 , 1x10016 and the blue car from 4563 . When the hobby train set went on sale at the Lego stores I bought two of them. A decision I didn´t regret for one single second. It´s the ultimative parts pack for train enthusiasts! Finally I decided to own the Santa Fe as well, but the set was already discontinued. Luckily enough I was able to get 3x10020 and 6x10025 at a very small local toy shop for the normal price . During that time I also was interested in the monorail system. I bought the 6991 , transferred another engine to a german maglev train, got (just) the train from 6399 (the complete set was and still is very expensive) and finally was able to get my hands on 6990 . So my monorail system is complete. Last year Ras was so kind to sell me the BNSF 10133 . Some TTX-cars would nicely fit to the engine, but these cars are really hard to get for reasonable prices. This year I started with the new PF-train . I got the complete collection with the flexible track (not worth the money in my opinion) and the PF thingies, but I´m still waiting for the RC transmitter. Having won this years event competition allowed me to add another passenger car to the steam engine (see above). The new PF-train and the RC-base I got last year made me think of building RC-trains as well on the plastic rails. I love the RC train rail crossing. Now I own a double circle and my first RC engine MOC is a modified Crocodile: (click on the thumbnail to see the real thing). Playing with the collection is sometimes hard: The lack of space makes it hard to build up everything. Almost every set ist put away in large boxes in a seperate room where it´s hard to reach the single engines and the other stuff. So last year I decided to show off my complete collection and do something good for younger children as well: The local parish festival in my home town is an ideal way to let children play with the trains, collect some (very little to be honest , I wanted to make it cheap for the kids) money for the "good cause" (all the money earned on the festival goes to 3rd world projects) and have some talks about my hobby. This is the folder of last years festival, here you can find the pics of this year. Sorry, it´s not public by now - and I was too lazy to write another topic here about it so far. But it´s on my to-do-list. Thanks for reading and see you around the new Train Tech! My first Lego sets were from the late sixties (sent out from my German grandparents), my first train was 171, which I combined with the 4.5V lego motor. Australia had limited trains (171, 181 & 182) so I didnt get any more before my dark ages started around 1980. In 1995 my dark ages ended with some of the exploriens sets, and a bit of a space binge. I also bought a few town sets which awakened a nostalgia for the 70's legoland sets, a lot of which I bought on eBay including most of the 4.5V and some of the 12V trains. I then discovered the 80's grey track trains and the 9V trains. Unfortunately I can't afford to buy all of those I'd like I've bought a few wagons from the sets and built up a few from individual parts. I have 3 hobby trains and bought a holiday train. Somewhere along the way I decided having a Lego train/town layout was cheaper than a HO train layout and Lego as a hobby. I'm now concentration on building a layout with modular style buildings. It will be European styled, with trains style on German ones but with a mix of fantasy and reality. BTW thanks for the focus on trains, its inspiring seeing all the great train Mocs from your staff and members. I've only really been building trains since 2006. I've always been interested in trains, and it's all because of my father. He's always loved trains, probably because my grandfather worked for the railroad. He frequently took us on scenic railroad tours whenever possible, usually pulled by steam trains. I still remember my first trip on a steam train back when I was three years old on the Cumbres and Toltec Scenic narrow gauge railway out in New Mexico and Colorado. As I grew up I had a modest collection of HO gauge trains which I played with frequently, I even went so far as to get a train table built (with a lot of help from my father) for a future layout, but it never materialized. In the end my collection got packed up and it's still in boxes in a closet in my parent's house. (I'd like to set up a LEGO train layout on that table we built, but it's so big I don't know if we could ever find room in our house). I never got into LEGO trains because, quite frankly, none of the LEGO trains I saw in the LEGO magazines ever looked like trains. European styled locomotives have never looked like trains to me, more like little sedans, airplanes or Volkswagen vans. That all changed, though, when LEGO released the My Own Trains system and the Santa Fe Super Chief. My first LEGO train sets were purchased in 2003 at the young age of 24 I was able to purchase two copies of the 4535 LEGO Express Deluxe when Toys R Us was liquidating them at $50 a piece. Then at Brickfest 2005, my next train purchase came as a lucky find: one of the vendors had a complete Santa Fe Super Chief collection (1 engine 5 cars) at just about retail, even though the sets were about to be or had already been discontinued. Since then I've purchased several more train sets, as well as added to my tracks. After that it was the infamous Tuesday Morning sell-off of the re-released Metroliner at $75. Since then I've now also purchased, I believe, the BNSF, the TTX cars, an extra MOT green passenger wagon, the Hobby train, two Emerald Nights, and my wife owns the Holiday Train. My first train MOC, though, comes thanks to my wife. During Christmas of 2005, my wife and I watched the movie "The Polar Express" for a second or third time, and she asked if I could build a Polar Express as a static display. Not wanting to turn down a challenge, I decided to make a fully functioning 9v capable train. It was a daunting challenge, but I think I did rather well for my first time out. It's a design I can't seem to leave alone, though, I've updated her many times now. After I completed her, I was commissioned to make a copy, and with the modest proceeds I was able to buy the extra parts I needed to build a classic old west style American 4-4-0 steam engine. It was all downhill from there. Next I built two locomotives from the Texas State Railroad. When Ben Fleskes introduced his Big Ben Bricks wheels in different colors, I was finally able to build the Blue Mountain & Reading #425, a Pacific class locomotive I had wanted to build, but built the TSRR #500 instead. I'm glad I put it off, she turned out terrific. I've started dabbling with the new Power Functions trains, and I'm very impressed. While I won't be abandoning 9v, I've already upgraded my Allegheny over to Power Functions, and I'll be building a second Power Functions enabled tender for my Polar Express so that I can run her either on 9v or PF. If anyone cares to know what my next project will be, I am working on building a PRR T1 Duplex 4-4-4-4 with some wicked streamlining. Unfortunately the design necessitates articulating her where there never was articulation, but I think it'll work out for the best. Finally, here's a YouTube video of all but a few of the locomotives listed above. Quick introduction for those who don't know me already. My name is Elroy. I live in the northeastern U.S. I'm a member of NELUG and I've been building trains for several years now. I actually became involved with NELUG after seeing them at a train show while hunting for n-scale models. My fascination with trains actually started when I was small. My brother had an HO layout that I was always envious of. After he passed away, and I became old enough to buy my own models, railroading became a sort of way to reconnect with him. 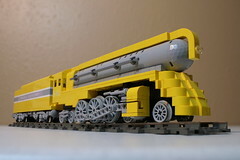 After seeing NELUG's layout at a show, I saw that my Lego hobby and train hobby could be perfectly combined. My first Lego trains were two of the My Own Train sets that I bought for half-off at a Toys R Us store. About a month later I got lucky once again and picked up a couple of the blue passenger trains, also for half off. This gave me plenty of parts to begin working with. My first custom train was my Adventurer's Train which has now seen a few years worth of train shows. Since the initial build, a flatcar with a plane and a crane car have been added to the consist. My other popular train is my Brickling Brothers Circus Train inspired by a Duplo giraffe that I found in one of my bins. Over the past couple of years I've been building less fantasy-style trains, and more prototypical. My "home" railroad, which ceased operations in 1965, is the Rutland Railroad which used to operate in the state of Vermont. To date I've build a Rutland Alco RS-3, a couple of boxcars, and a Rutland gondola in both six-wide and eight-wide. I'm starting to get into 8-wide building these days, and experimenting a bit with steam. The past year plus a bit have been focused on getting my home layout up and running though. after a dark age of almost 20 years, my wife encouraged me pick up my lego activities again. After a hesitating start, I have extended my collection a bit. As my main interest is city, I really prefer the train segment. As I did not have any trains in my child colelction, I started brand new and choose for the RC trains. The major sets exist in my collection, but what I really like to do is build my train table. I have digged deep and bought myself a lot of track and bricks to build a small table where the train can go round, and more important up in the sky. When the trains leave the table via the 2 track bridge the make a large straight track through the village. Some photo's here to show some WIP. I must say that at the moment my entire collection is in boxes. We moved to a new home and there is no lego room yet. However I have claimed the attic above the car shedm, but that room has still to be made ready befor I can even think of a layout. When autumn comes I will use a small table on our first floor to crate some mocs and work out my ideas for the real lego room. So unfortunately no updates from me real soon, but after summer I will make a flying start. good to know all of you. Sign me up, too, even though all I have are the Super Chief F7A and the TTX Doublestack (which is really incomplete, the shortest TTX articulated I know of is a five-unit--I have an MLCAD design for this, PM if interested). My game, though, is designing near-scale, 10-wide models of the great "name trains" from America's "Golden Age" of passenger Rail. In the late eighties, about twenty years ago, I laid eyes on walls of Classic Space sets in the local toy shop. For the next few years, I was a die hard fan of the theme, with a vast collection of spaceships and moon-bases. Then, in the early nineties, walking through the same store that had fueled my love for LEGOs from the beginning, I stumbled across 4554 Metro Station : the 9V line had just been introduced, and for the first time, Trains caught my attention. I soon acquired 4563 Load and Haul Railroad , 4547 Club Car, and 4558 Metroliner. Then, as my studies became more demanding, I entered my dark ages. Only when I turned sixteen did I return to LEGO, with my Trains purchases including 10017 Hopper Wagon , 10014 Caboose, and 10016 Tanker . My friends and I had hours of enjoyment powering the trains along the tracks - with the occasional crash, of course. Then came 2002, and I became very excited about what was appearing on the shelves. 10020 Santa Fe Super Chief , enough copies of its cars to make a full train , 4535 LEGO Express Deluxe, and 10205 Large Train Engine with Tender, Black quickly made their ways to my layout. In the coming years I also purchased 10133 Burlington Northern Santa Fe Locomotive and two of 10170 TTX Intermodal Double-Stack Car. When Remote Control trains began popping up, my train income halted: I had no idea how I would integrate Remote Control trains into my vast 9V collection. This Train fasting continued to the present, when the Power Functions train 10194 Emerald Night was unveiled. I'm currently toying with buying the new loco along with some of the Remote Control and 12V line. That's my LEGO Trains history in a nutshell; hope to see you 'round the new subforum! I'm loving all these illustrated stories - nice! Most people grab the images from this website: http://www.fa-meier.de/lego/depot . It contains small images of all the trains from 4.5V to Power Functions, with the Roadside Structures and MOW Vehicles and track included. TheBrickster on behalf of every other member, these links you shared with us are very useful. 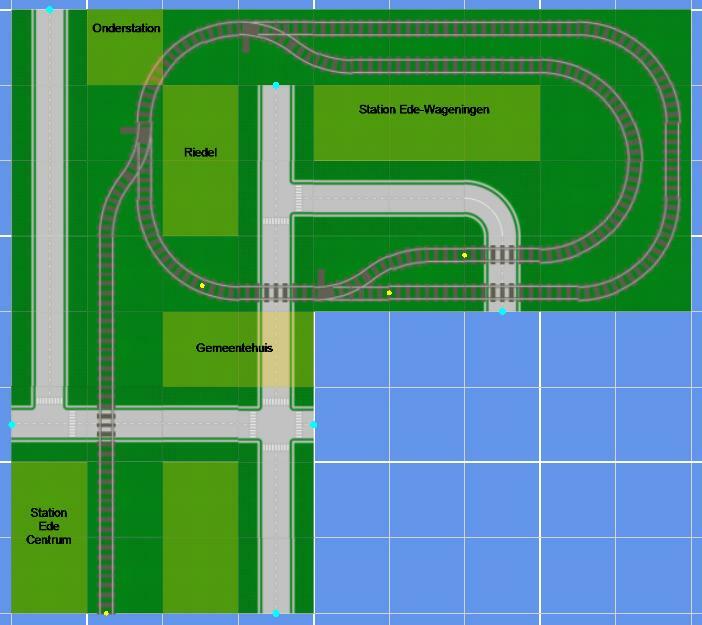 As for my movie, I am working on a track layout from one of the diagram on one of the sites. Thanks Pete, but why don't you share a little bit about yourself here in the registry and your train collection/interest. Well ok, i hadn't thought of that..
Im ConductorPete known as the Manager/Director of Lego City Rails and I started my city collection when i was 9 and started my train collection a couples of months ago. As a individual I decided to create a movie which has been hard to create as I cant afford the stuff needed and the train, so soon im getting the 7897 Passenger Train for my 15th birthday and just recently bought Conductor Charlie and Engineer Max the two famous train idols known to lego trains. As a fangroup I wanted to be a group but I have no employees at the moment so im on my own. My interests are lego, drawing and basically more lego and I now I am on hotmail so if anybody has any queries you may contact me at legocityrails-at-live-dot-com an I should be able to anwser your queries within the 24 hours . Well a warm welcome, this tells us at least a bit more about yourself and your ambitions. One advice, I would take out your emailadres the way you wrote it here. This way it could lead to all kinds of spam in your mailbox. Maybe something like legocityrails-at-live-dot-com would do better for this. Hi, I'm Tim Gould (aka Gambort) and I've built and designed (in CAD) quite a few trains. You can see them at my Brickshelf trains folder and my flickr trains set. My current project is fleshing out my Ol' Brittania train set to make it feel like a proper toy train. I've also put various instructions up for trains. Most recently a Western train as a Christmas present. Wow, nice MOCs! We are extremely lucky to get 2 such fantastic train builders grace us with their presence at the same time. Welcome HoMa and gambort, and thanks for sharing some of your wonderful creations with us! Well, my first "kind of" experience with Lego trains was a bunch of hand-me-down Lego that me and my brothers and sisters had as children. It was all old 4.5V blue rails and sadly we could never work out how to get the motor working, nor could we ever figure out how you were supposed to get curves to work out (looking back it's because lots of bits, including all the inner curve rails, were lost). I remember longingly looking at pictures of the 12V trains and then later the 9V ones, but new Lego sets were mostly out of my parents price range and the train sets doubly so. Anyway, the dark years came and went, and I saw the UCS Imperial Star Destroyer model and just knew I had to have it. Little did I know at the time that would kick start a lost passion and now I have amassed a stupidly large Lego collection again, far more than I ever had as a child. Seeing the Emerald Night preview pictures brought back so many memories of days staring at the old train sets and I figured it was time to finally experience some Lego train sets. One S@H trip later and I had both the RC train sets to play with! Naturally it wasn't long before that was finally followed up with the exceptionally beautiful Emerald Night. Have to admit I'm a little sad to have missed out on the 9V era, which so far seems to have really been the peak of Lego trains. That said, I'm really interested to see how the PF stuff goes, especially as I was always a bit of a Technic fan too. And I never cease to be amazed at some of the creations AFOLs have come up with, many of which it's hard to believe are made out of those same plastic bricks we all know and love. I'm Yoshi648. My first (and currently only electric train set) is 4561. I received it as a gift many years ago when it was still new. I had so much fun building it and watching it go around in circles. A few years later I randomly got a hold of 10015 that I saw on sale at Target. While it doesn't match the style of 4561 whatsoever, I still thought it was cool to have an additional train car. Every now and then I like to take it out, rebuild it and watch it run on the one oval of track I have. I don't really have much money to afford real trains, but I like to digitally create them so that I may build them in real life someday. I mainly like to build trains that appear in video games. My current project is the Excess Express from the game Paper Mario and the Thousand Year Door. I like looking through BrickShelf / MOCPages / Eurobricks / Railbricks and seeing all the wonderful trains that others' come up with and I love seeing images of large town displays.